University College Of Montgomery Sahiwal Punjab. 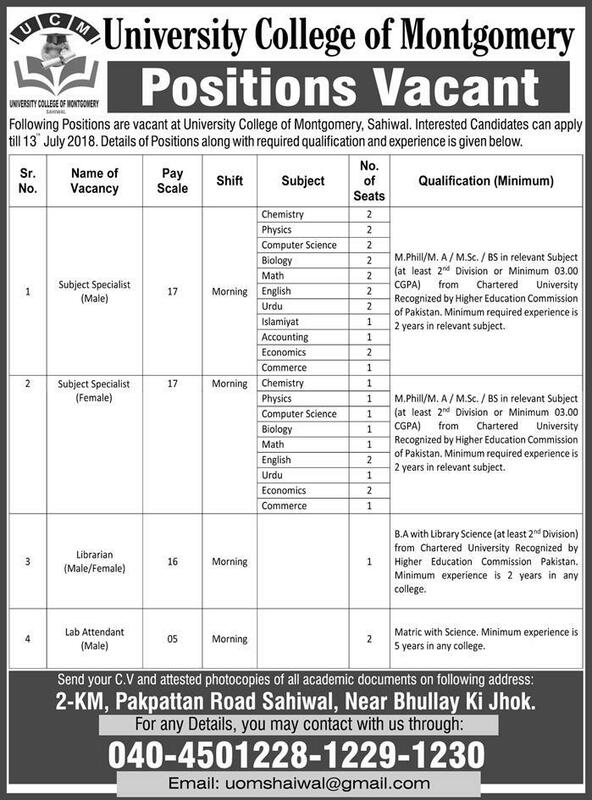 Following Positions are vacant at University College of Montgomery, Sahiwal. Interested Candidates can apply till 13 July 2018. Details of Positions along with required qualification and experience is given below. M.PhilVM. A / M.Sc. / BS in relevant Subject (at least 2r4 Division or Minimum 03.00 CGPA) from Chartered University Recognized by Higher Education Commission of Pakistan. Minimum required experience is 2 years in relevant subject. M.Phill/M. A / M.Sc. / BS in relevant Subject (at least 20 Division or Minimum 03.00 CGPA) from Chartered University Recognized by Higher Education Commission of Pakistan. Minimum required experience is 2 years in relevant subject. BA with library Science (at least 2"d Division) from Chartered University Recognized by Higher Education Commission Pakistan. Minimum experience is 2 years in any college. Matric with Science. Minimum experience is S years in any college. Send your CV and attested photocopies es of all academic documents on following address: 2-KM, Pakpattan Road Sahiwal, Near Bhullay Ki Jhok, Sahiwal.